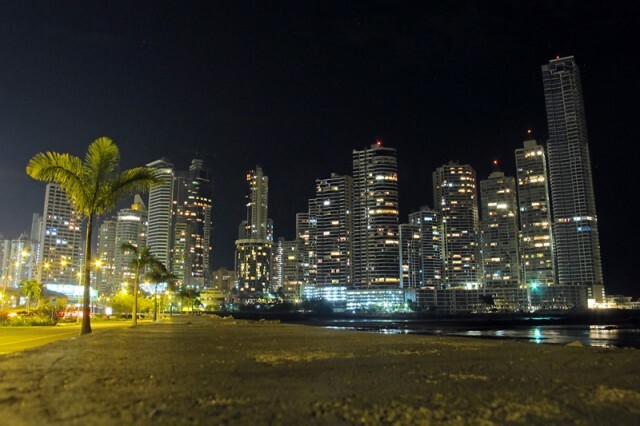 I’ve been interested in visiting Panama since I went to Costa Rica back in the 90’s. At that time I thought it would be great if I could rent a car and drive down to Panama from Costa Rica. However, I was with a group that had a set itinerary so the idea of visiting Panama got sidelined for a while, but never faded away. This spring when I was booking my frequent flyer ticket for a trip to Peru I noticed that some of the flights stopped in Panama City on certain days for a layover. By figuring out which days this layover happens I was able to calculate my frequent flyer ticket to get a 4 day layover in Panama for just an extra 15k miles. The round trip ticket on Continental Airlines cost 52,000 total frequent flyer miles plus $180 in booking fees. The booking fees should have been less but I booked last minute which brought the cost up. The itinerary included a flight from Portland to Panama City (4 day layover), then on to Peru for 3 weeks, and finally back to Portland in First Class! The first class part is what bumped up the amount of frequent flyer miles needed, but it was the only available option and a nice way to end the trip. I took 5 other flights within Peru, but those were separate deals and arranged later on other airlines using a combination of more frequent flyer miles and a locally bought ticket. 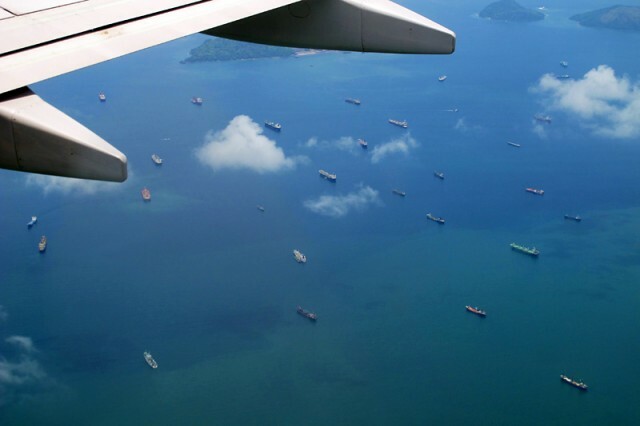 If you like to travel and haven’t gotten on the frequent flyer bandwagon now is the time. Just email me if you have any questions. 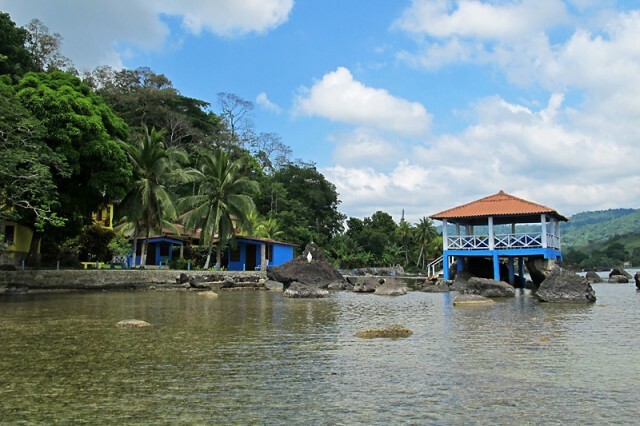 I have created a Cosmic gallery with the Panama City and Portobelo scuba pictures on CosmicAdventure. If you want to skip this long journal of my trip to Panama and just view the pics feel free to check out that gallery. Some Peru pics have been uploaded there as well, but I still have more galleries to complete. On to Panama! After a red-eye flight from PDX to Houston, a 3 hour layover in Houston, and another flight to Panama City, I finally got out of North America for the first time since 2005! I must say the red-eye flight was a bit unpleasant. I was unable to sleep in the small space given, especially when this Asian dude sitting next to me kept leaning over into my personal space while he was trying to sleep. I did doze off a few times on the morning flight to Panama, but for the most part got zero sleep on the way to Panama. I did meet a nice Canadian fellow on the plane, the first of many on this trip (Canadians and planes). Canadians like to travel and now that their dollar is stronger than the U.S. dollar they are vagabonding even more than usual. This guy was flying into Panama and out of Costa Rica two weeks later. He had no hotel or transportation reservations, and no clue how he was going to get to Costa Rica, or what to do in between it all. His plan was about like mine would have been 10 years ago, but these days I’m a slightly more prepared and not as interested in winging it. I wished him well, as we exited the plane and stepped foot into Panama. I picked up my checked backpack, and for the first time I can remember was met by someone holding a sign with my name on it. Luis was sent by the hotel to pick me up. He spoke little English, but was very friendly. After a delay in trying to get his truck started we finally headed into the city. He dropped me off at the Hostal Arucca, a nice little budget hotel with a hostel feel. It was the cheapest place I could find in Panama City (still not that cheap) that wasn’t a dorm style hostel, but instead a hostal which is more like a budget hotel. Panama City is very modern and nice, but for some reason accommodations and many other things here are surprisingly expensive. Upon Check-in I received my first unexpected challenge of the trip when I pulled out my Visa Card to pay. The concierge Yenny who spoke zero English said “no no no” and pointed to a sign taped to the desk saying that they no longer accept credit cards. This is not what I was led to believe on Expedia where I made the reservation with a credit card. Fortunately in Panama the main currency is the U.S. dollar and I had just enough to cover the bill. Unfortunately all of that cash is what I planned to get through the trip in Panama and beyond. Now I’d be left without cash until I could find an ATM, which would no doubt charge a ridiculous transaction fee to withdraw a very limited amount of cash. Things never go as planned when you travel abroad, so you just have to grin and bear it, and remember you travel to escape the ordinary and expected. The front area of the hostal had a TV, open patio, chess board, and hostelers just hanging out surfing the web on their netbooks. I later found out many of these people were with the Peace Corps and residing here long term. After the maintenance guy made some quick repairs to the window in my room I entered and found it to be basic but quaint. No TV, phone, or other amenities in the room, but I did have wifi, which is all I needed. There was AC and hot water (lasts about 2-3 minutes) which isn’t always available in Latin America. The windows were jalousie style like I had in Florida when I was a kid. They are like mini blind windows but bigger with the panes being about 4 inches wide and closing like blinds. One pane was missing in the shower which might be a bit unnerving for a woman, but I wasn’t too worried about it. The toilets here are the much talked about low flow or low pressure toilets which all the guide books warn you about. Basically if you flush any toilet paper down the toilet it will clog and overflow. To prevent this you have to toss the toilet paper in the trash bin which is always located right next to the toilet; standard procedure in Latin America. After checking in I tried to take a nap but couldn’t sleep more than 20 minutes. I went around the corner to the supermarcado and Mexicanita Restaurant which the hotel recommended. I could make out most of the Spanish menu, but was reluctant to try anything with meat in a place that was not quite upscale, let’s just call it downscale. I figured vegetarian nachos were a safe bet. The chips were just ok, the cheese was like string cheese quality, not so good. However the fresh pico de gallo, and habanero sauce that was served on the side was excellente! I also got a caliente te’, or hot tea. Fortunately the water in Panama is safe to drink in most developed areas of the country, although you can really taste the chlorine. In any case potable water from the tap is a rarity anywhere in Latin America so this was a plus. It meant I could brush my teeth with sink water and order drinks containing ice without fear of Montezuma’s revenge hitting me. Panama is very Americanized for a Latin country. It kind of reminds me a bit of the Philippines. There are billboards everywhere advertising American companies. One of the first ones I saw was a jewelry ad which had Nicole Kidman on it (technically not American, but still a representative of Hollywood materialistic culture). Speaking of materialism the currency here is the U.S. Dollar. They also have the Balboa, and sometimes call the dollar the Balboa. You will occasionally get change in real Balboas which are the same size as U.S. Coins but Panamanian. All the paper currency is in U.S. Dollars. After my Mexican meal I was able to catch a few hours of sleep finally. When I woke up it was dark. I wasn’t that hungry but hadn’t really had a solid meal since I left, and my last meal at home was mac and cheese. So I decided I would go ahead and hit the Hard Rock Cafe tonight which was almost a mile walk down the Trans America Highway from my hostel. I actually thought it was closer but it took me about 15 hot and humid minutes to walk down there along a somewhat dark and isolated sidewalk. I didn’t feel unsafe as this city is fairly safe overall, however I decided on the way back I would catch a cab which the guide book claims are typically about $1.50 to get around most places in town. I walked around the modern mall and movie theatre area for a while where there was a Bennigans and Irish Bar available, but HRC is what I came for. I found the HRC and got a guitar magnet to add to my magnet collection and then ordered up a Panama beer and dinner at the bar. The beer was a typical green tasting beer, and sandwich was standard American fare but it hit the spot. Next I ordered the country beer the Balboa. Being on draft it was a bit better than the Panama, but about what you would expect from a Latin American beer. The name Balboa is everywhere and seems to refer to many different things. He must have been like the George Washington of Panama. Hold on a second… What would I do without google and wikipedia? Apparently Vasco Núñez de Balboa was a Spanish conquistador and politician among other things. He was first was the first European to cross the Americas to reach the pacific. Although crossing the very narrow country of Panama was probably a lot easier than the route Lewis and Clark took across the U.S., he did it in the early 1500’s, so I guess he deserves a little credit for that. Knowing the history of the Spanish and their conquistador ways he probably did a lot of other things that weren’t so great. History has a way of favoring the cultures that do the writing of it. I’m not a historian so let’s not get into those other details. After HRC I was able to recoup some of my cash supply since I found a HSBC ATM outside the mall. I felt a little vulnerable with a fistful of cash and a lot of characters hanging around the ATM in front of the mall, so I went back in the mall and spread the cash around to different pockets and inside of my sock just in case I was mugged. I have a long history of incidents with taxi drivers so it’s always an adventure for me to take a taxi, but in this case it was necessary. There were plenty of cabs waiting out front of the mall and more driving around so finding one was no problem; finding an honest one, well that is another story. I flagged one down and told him where I was going, then asked cuanto cuesta (how much?) He said 4 dollars which I knew was an overcharge. He just looked at his watch as if to say at this time of night you have to pay more, and being around midnight and loaded with cash I didn’t want to chance walking back, so I agreed. He drove me back the long way and we chatted it up quite a bit with his broken English and my broken Spanish. He said you no look for girl tonight? I said no, yo casado (married). He said oh that is problemo! Apparently this guy moonlights as a pimp. Then he asked if I was Americano or European. I said Americano, and he says oh Arnold Schwarzenegger this and that, referring to the recent tabloid fodder of his fathering a child with his housemaid. I said Arnold is actually Austrian, from Europe not America, but I think this was lost in translation. He asked where I was from and I said Oregon, he seemed surprised like he had never met anyone from there (probably hasn’t), but he did seem to know of it. When he dropped me off I only had 20’s and three 1’s. He didn’t have change (taxi drivers never do) so he reluctantly accepted the 3 dollars. Ha, I only got double charged instead of triple charged, a small victory for me against the taxi scammers. Now it was back to the hotel and my first attempt to use skype video chat so I can talk with Charlotte. It worked great! This morning I got breakfast at the hotel which was white bread and jam, along with coffee and some form of orange juice that was actually pretty good and kind of tasted like tang. Not great, but it was enough to hold me over. Today one of the ladies working the desk actually spoke good English so she was able to help me quite a bit. She said she is part owner of the hotel and her dad is from California, but she is from Panama. She set me up with a private taxi driver through a tour company to take me to the Miraflores Lockes on the Panama Canal for 30 dollars, which included the driver waiting for me there and continuing on to the old town area Casca Veijo later on for a tour. I wanted to see Casca Veijo but was nervous about going myself after all the warnings from the travel book, so this worked out good. She also set up my scuba trip for the next day which was quite a bit of work. 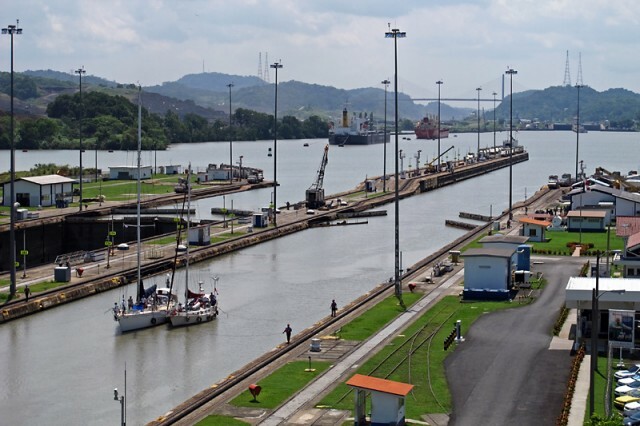 The Miraflores Lockes at the Panama Canal was about a 20-30 minute drive. The taxi driver agreed to wait for 1.5 hours. I kind of regretted having him wait because I wanted to spend more time there and it would have been cheaper to just get a different taxi driver back, but I already made this deal with him before we left and renegotiating in Spanish was not so easy. There were a few sailboats going through the lockes while I was there, but no big cargo ships this early in the day. I watched the short movie about the history of the canal, and ate the overpriced buffet dinner with a view of the canal. The food was just ok, but the view was great. It was a really cool place and very enjoyable to hang out here and ponder the amazement of this engineering accomplishment. Next the taxi driver took me to the old town area of Casca Veijo. This area is known to be a bit run down and shady so you can’t really walk there because of the bad neighborhoods surrounding it. Once we arrived I tried to get the taxi driver to just drop me off so I could stay longer than the hour he planned to wait, but he was insistent on waiting for me and driving me back. I guess waiting for me is what he considered a tour. We seemed to have a communication breakdown as I tried to explain I wanted to pay up and go it alone. I’m not sure if he didn’t understand or if he just didn’t want to leave me there, but either way I gave up trying to renegotiate our deal. Meanwhile he parked and waited for another hour while I walked around to explore the old town on my own. My first stop was a souvenir store. I had to be careful buying stuff in Panama because whatever I bought I’d have to either ship back or carry around with me for 3 more weeks in Peru. I checked into the shipping beforehand and it was outrageously expensive. I did almost buy a Panama hat, but for $80 it was a bit above my hat budget and I wasn’t sure of the going rate or quality standards. Besides these hats are originally from Ecuador, but popularized when President Roosevelt came back home from a trip to Panama wearing one. I figured whenever I go to Ecuador I’ll get the real Panama Hat. Eventually I got sidetracked and ended up on some shady dark alleys which the hotel lady warned me to avoid. There could easily have been a problem here, but today I had no issues. It’s a rough area for sure, but beautiful and classic at the same time. If Casca Veijo could be cleaned up a bit more I think it would be the pride of Panama City. Unfortunately tourism and cultural preservation does not seem to be a big priority here, yet. Nevertheless this area in its current state it was very charming and photogenic. After the allotted hour I found the taxi driver and he took me back to the hostal. Once we got back he decided that I owed him cincuenta instead of treinta, 50 instead of 30. I was going to give him 40 anyway so he’d have a good tip, but this was just jacked up. Despite my dispute he would not budge on the price so I had to give him the 50. The next day I reported this to the hotel owner. She could not believe what happened and was very unhappy about it, in a dramatic Latin type of way. Not wanting to cause a major uproar I said it’s no big deal and not to worry. However from what I can gather from her personality I’m pretty sure the taxi driver had not heard the end of it. I decided no more taxis if I could help it. Instead I took advantage of Hostal Arruca’s nice central location and took a stroll along the waterfront path which follows the Pacific shoreline and the Pan America Highway. It was a great opportunity for taking pictures of the city skyline and local people. In addition to the many joggers, bikers, and rollerbladers there were armed military and policio every so often to keep an eye on things. I felt pretty safe here, even at night. Later in the evening I went out to eat in the Bella Vista district around Calle Uruguay, which became my favorite spot in town. It’s a hip little street with night clubs, and good restaurants. That is where the Hooters is too, so if you can find Hooters then you found Calle Uraguay, and believe me nothing is easy to find in this city. The streets go off in all different directions and most streets do not have signs since they really do not have a postal service to speak of here. I passed up a nice jazz restaurant that looked a little too romantic for a solo traveler and opted for a cool German restaurant on a side street. For dinner I had a Nordlingen Wies beer along with cordon blue chicken dinner which was outstanding. The waitress girls were wearing German style dresses kind of like Oktoberfest servers, except they were Panamanian, which gave the place a twilight zone feel. The only other diners were some noisy American businessmen at the table across from me. I was hoping they wouldn’t try to talk to me and fortunately they were so self-absorbed in their corporate conversation that they didn’t. Not that I don’t like talking to other travelers, but these corporate types were rude and obnoxious so I just didn’t want to talk to them. In fact most foreigners I saw here were business travelers rather than tourists. I walked back to the hotel in the dark and had no problems even on the quiet dark streets. The NBA Finals were on the TV in the common area where I hung out on the couch with the Peace Corps group and enjoyed the game. The scuba dive guide Rafael picked me up at 8am and we headed out through the traffic clogged Panama City highways and back roads until finally reaching the open road extending to the other side of the country. The entire drive took about 1.5 hours. On the other side of the country we drove through a part of Colon which is described by the guide book as a rough town that is not safe to explore. Rafael confirmed this and said it is not a good place to walk around. We drove through more countryside where there were plenty of advertisements for the dive resort we were headed to. Finally we reached a beach paradise on the Caribbean where the Scuba Panama business operates out of. It was a fairy tale looking resort with several cottages for rent that were cheaper than my budget hotel in Panama City, if only I had known… Despite the abundant advertising and peacefulness of the place I was the only customer today. I had prearranged to rent a sea life camera since I did not bring my underwater camera case on this trip. Unfortunately this camera would not take my 4 gig card memory card because it’s an older camera, so I had to use the existing 512 card. Rafael who borrowed the camera from another guide said he would email me the pictures later on, and he did- one at a time. It turns out the camera battery was completely dead so we waited an hour for the battery to charge before heading out on the dive. Everything here is slow paced, even in Panama City which is a bustling city, but somehow most people maintain a laid back vibe. Once we finally got on the boat the dive site was only about 3 minutes out. We had a junior dive guide driving the boat and staying up top. I was relieved at this because I wasn’t sure of their safety standards and wondered if the dive guide would be pulling double duty as the driver and diver leaving the boat unmanned, which would not be good. My concerns were unwarranted as they actually were more cautious and safe than most places I’ve dived with, including Hawaii the previous month. The guide even carried a diver down floatable connected via a string to track our whereabouts during the dive which was the first time I’ve ever seen that. Before going overboard Rafael did the catholic cross ritual across his chest making me more nervous than reassured. I wouldn’t normally think of a dive like this as dangerous, but I suppose it could be. Immediately on our decent down to 70’ we saw a sunken B-45 plane. The camera was not performing well and I wasn’t sure how to use it so I didn’t really get many good pics, but it was a cool site. We went along the shallower surrounding reef for about 45 minutes where the water was clear, but there was a lot of small particles floating around which looked like mini jellyfish or some kind of debris. Overall I saw a lot of little fish, but no big fish or any of the other usual suspects like stingrays and eels. After this dive we parked on a beautiful little island to get an hour rest between dives. Then back to another reef which was close to the first dive. This was a bit shallower with more varieties of fish although small, but finally we did see two big lobsters. The water was warm and the reef was big with lots of different coral so I was surprised at the lack of sizable fish. Maybe it’s been fished out by locals like the Mediterranean has, essentially making it an underwater dessert? I suspect much of the oceans will look like this in the next hundred years anyway. It’s sad, but there isn’t much you can do to help the problem except eat less seafood. After the dive we went back to the resort area and I helped push the boat up to the doc, it took 4 of us to push it up the track so Rafael could tie it up. We had a preset lunch cooked by the local ladies consisting of small fish, rice, and salad. This confirmed to me that since the locals were eating these small fish there probably weren’t any big fish left in the area. In most places fish that small would not even be bothered with. After about another 1.5 hours of hanging around we finally got going back to Panama City where the typical afternoon tropical thunderstorms were starting to roll in. I have to say the drivers in Panama City are crazy, and I’ve seen some crazy places. I witnessed one heated exchange between two drivers at a toll booth, and several near rear end accidents to our vehicle. Motorcycles were whipping in and out of traffic while pedestrians darted back and forth across the streets. It’s not the worst I’ve seen, but still pretty bad. The one thing that could have made it all seem normal is if the Van Halen song Panama came on the radio, but it wasn’t quite meant to be, the radio DJ played Jump instead. To celebrate a good day of diving Hooters was in the forecast for my dinner. I sat at the bar where the lovely bartender Yesica served up some Balboas and a 3 Mile Island hot Chicken Sandwich. Unfortunately Yesica, and many other people in Panama, spoke very little English which made for a quiet dinner in an otherwise happening restaurant. Even in the tourism industry, at the airport, and some workers in customs do not speak any English at all. Not that I expect people in a Spanish speaking country to speak another language, but in most tourism places it’s common. If you ask Panamanians habla ingles, they all say poquito, which is unfortunately what most Americans say about Spanish due to our late start on foreign languages in the school system. Anyway the lack of English is kind of surprising given the amount of Americans visiting and doing business here, but I guess the Panama tourism industry is still in its infancy. Sometimes when you travel you need a vacation from the vacation. With the tropical heat and my original plan getting sidelined this turned out to be one of those days. I had planned to go to the Parque Natural Metropolitanio on my last day, which is like the Forest Park of Panama City. It’s a huge tropical jungle preserve in the middle of the city. I found out that morning the visitor center which gives tours is only open for a few hours early Saturday morning, and not at all on Sundays. Although the park was still open until later in the day I wouldn’t be able to get there until afternoon. Without a visitor center or guided tour it would be too risky to hike alone in this huge jungle preserve surrounded by urban city. It’s just too easy for someone to rob you in the jungle when you are alone, as many guidebooks will emphasize is a problem throughout Latin America. Aside from the threat of robbery there can be many frustrations when traveling to developing countries. I know you have to adapt but sometimes you just can’t help but think if they could only do things slightly different it would be so much better for everyone, but they don’t or won’t for whatever reason. As an example I read that there really aren’t many good museums in Panama, which is mostly due to the fact they are all closed on weekends because museum workers want the weekends off. Coincidentally that is the only time locals would have time to go, so most of the museums have closed from lack of business- doh! As I was pondering this and eating my hotel breakfast the owner was having some kind some kind of ceremony with her daughter and another guy who was reading from a book while tossing water everywhere. Afterwards they had carrot cake so she offered me some, and explained that the priest was blessing the business after being open for 1 year. I can’t say that I’ve ever seen that done before in a hotel, although I have stayed in some hotels that could have used a blessing. To avoid taxis I decided to walk to the financial district of El Cangrejo to check out the area. Unable to find a reasonably priced restaurant that looked appetizing I decided to go ahead and eat at one of my least favorite places, but a place that is always interesting to visit while in another country- McDonalds. Although the restaurant was quite elaborate having two stories, LDC TV’s, and even a delivery service, the food was subpar as expected. I did like the oreo cookie ice cream dessert though. After lunch I continued to explore El Cangrejo and ended up walking all over the downtown area making quite a long hike around the spread out area of downtown Panama City. I figured if I ever got totally lost or ended up in a bad area I could always flag down a taxi, but I was motivated to make sure things didn’t come to that. I toured the local shopping mall and walked by countless U.S. fast food chains like Burger King, Wendys, Subway, Quiznos, Popeyes, KFC, etc. More signs of Americanization. Later that night I hit the hip Calle Uruguay area again. I went to dinner at the Londoner pub to eat some typical pub grub chased by a Balboa beer. The atmosphere was good and the NBA championships were on with the Mavericks and Heat playing again. I felt comfortable in Panama City, maybe a little too comfortable. It’s definitely an easy place to fit in, but a little too familiar for a real exotic travel adventure, at least in the capital city. The rest of the country looks very promising from what I’ve seen and read, but with a lack of tourism infrastructure traveling isn’t as easy or rewarding here like in some other places. My mind wandered and I began to think about the next three weeks I’d spend south of the equator in Peru on the Gringo Trail. Tomorrow I would leave Panama; then the real adventure begins!